Specialty pharmacies provide service and support to patients with complex medical conditions throughout the country. Along with this privilege comes the enormous responsibility of making sure these patients receive medications that are safe and stable to use. US Specialty Care (USSC) takes this responsibility seriously and has performed extensive tests in partnership with Temptime Corporation to develop cost-effective solutions to overcome the everyday challenges of shipping temperature sensitive medications. The FDA approves medications only after vigorous clinical trials demonstrate the stability, safety and efficacy of the product. Since many medications, such as biologics, can be sensitive to temperature, manufacturers provide a specific temperature range that must be maintained for each drug. Following these guidelines are essential to maintaining the integrity of medications during storage and shipping. 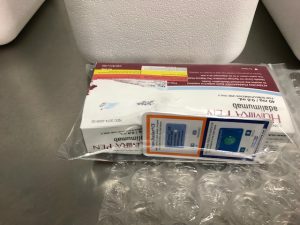 To further ensure patient safety, the legal and regulatory landscape is shifting and pharmacies are expected to communicate the reliability of the cold chain with patients, which may require that indicators, trackers or other devices be included in packages so patients can easily determine if medications have been stored improperly or exposed to extreme temperature variations. What happens when a drug is exposed to an unapproved or unstudied temperature excursion? Medications could lose potency, potentially making the therapy ineffective and leading to progression of the disease being treated. There are also significant costs associated with replacing medications if they have fallen outside the accepted temperature range. The uncertainty of a medication’s stability while in transit can result in missed doses or a delay in therapy, which may also impact overall health care costs. Due to the complexities and variations involved with shipping drugs, there is no “one size fits all” packaging solution. Instead, the options are seemingly endless – ranging from sophisticated monitored totes that control the shipping environment precisely, as used by manufacturers, to insulated bags and everything in between. Most packaging suppliers offer an array of pre-qualified thermal shipping solutions that are specifically designed to stay within the ranges required to ship temperature sensitive medications. When selecting your packaging, it is imperative to choose a solution backed by proper testing that verifies its effectiveness at maintaining a specified temperature range for a period of time. 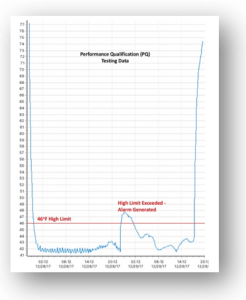 These pre-qualified packouts will guarantee adherence to a temperature performance profile for a specified duration. Solutions should include an operational qualification (OQ) testing report outlining the validation testing procedures conducted by the packaging supplier as well as by an external third party. The data must demonstrate it follows standards such as the International Safe Transit Association’s ISTA 7E Testing Standard for Thermal Transport Packaging. The pharmacy is responsible for conducting ongoing performance qualification (PQ) testing to ensure the packaging continues to meet the appropriate standards, based on all of the above. To meet our high standards, USSC requires proof of stability claims before we will consider using any packaging materials. This includes documentation and data from packaging suppliers along with the methodology and results of tests conducted by a third party laboratory. Packouts should be tested seasonally to ensure standards are met in varying environmental conditions. These tests should simulate actual shipments in practice as closely as possible. All shipping scenarios anticipated by the pharmacy should be tested. This includes considering the various geographies and climates being serviced as well as the number of packout sizes being used. It’s important that each test scenario is conducted more than once to validate results. Using a data logger to record temperature throughout testing can provide helpful insight into incremental temperature changes during transit. Choosing the right data loggers is of the utmost importance to ensure the data collected is accurate. Only select data loggers from a reputable company who can provide information regarding the calibration and accuracy of their products, and who offers exemplary customer support. USSC selected Temptime’s EDGE M-300 Bluetooth®-enabled Temperature Sensors. 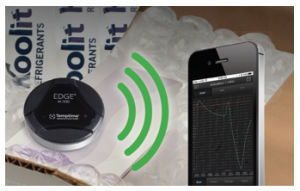 The devices link with the EDGEVue mobile app for easy set up and data retrieval. There are additional data-sharing, storage and reporting capabilities offered through the EDGECloud. The sensor can be reused, due to a replaceable battery, and provides accurate readings even through packaging material. Prior to selecting the EDGE M-300, we performed extensive tests comparing the performance of various data loggers available in the marketplace to ensure we were getting the most accurate and user friendly option. 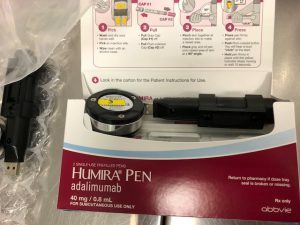 When conducting our test shipments, we begin by placing a biologic medication, such as Humira, inside a packout that follows our current packing protocol. We then place data loggers inside the payload area as well as outside the thermal cooler, either between the box and the cooler or in a padded envelope taped to the outside of the box. This allows us to record the internal temperature and external ambient temperature during transit. The test packages are then shipped to various destinations across our service area. Several shipping scenarios are used, and each test is done in duplicate to serve as a control check for the first. Test packages are documented and witnessed by a pharmacist and technician. Results are analyzed and discussed with a diverse team of experts, which includes a logistics specialist, clinical pharmacists and an operations specialist. While accrediting bodies require testing twice a year, we choose to perform tests on an ongoing basis as well as before any packaging process changes are made. This process helps us keep patient safety at the forefront of any decisions we make, a critical goal for our organization. • Set the appropriate time increments for measuring temperature as small volume biologics can be sensitive to even short periods of exposure to extreme temperatures. It is important to precisely follow the manufacturer’s instructions for each of the different packouts to ensure that the temperature performance profile is upheld. Any deviation could potentially cause the package to go out of range. Even slight changes to things such as bubble wrap, dunnage, the temperature of your cold packs or orientation of the packout, can have consequences. Additionally, adding supplies to the package (e.g., Sharps containers, needles, etc.) alters the payload size, which can affect the performance of the packout. These are some of the many reasons it is important to perform frequent and extensive testing with your packouts, simulating all shipping scenarios your pharmacy may encounter. 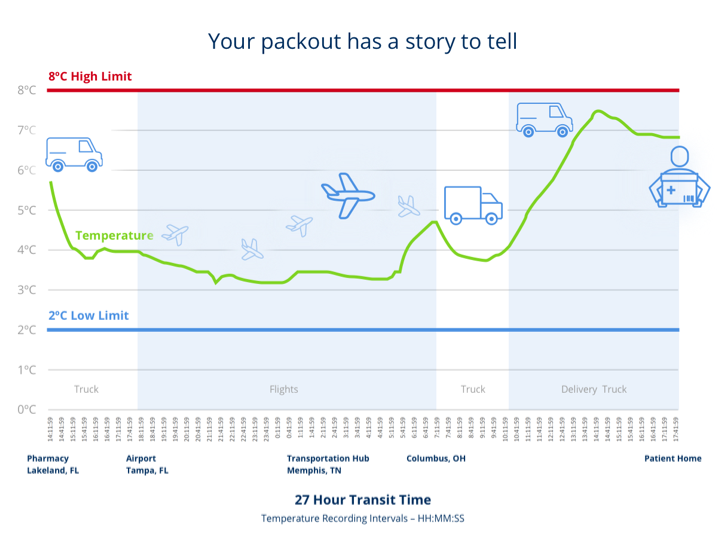 What happens to a cold packout when it’s packed and shipped from a cold geographical region where it can sit outside on the dock or in the courier sorting facility for hours with exposure to extremely low temperatures? Exposure to freezing temperatures can potentially be even more detrimental to drugs than exposure to heat, rendering the drug ineffective or unsafe for use. What are the risks of flash freezing? In some cases, flash freezing can occur when frozen ice packs are packed with medication in a cooler without being properly conditioned per the guidelines provided by the packaging supplier. As noted, freezing can be detrimental to the stability of some medications. Making matters worse, freeze events can often go unnoticed since the drug may thaw by the time it reaches the patient. The packout instructions provided by the supplier should include specific information regarding the conditioning time and temperature of the frozen ice packs. How do we preserve temperature control during the last mile when we are shipping to geographical regions that frequently experience extreme temperatures? First and foremost, by selecting the appropriate packouts, and by conducting ongoing PQ testing. Additional mechanisms such as visual temperature indicators can further strengthen your quality control processes. When placed at product level within your packout, they provide a clear alert when a temperature limit has been exceeded for a period of time, thus helping to prevent administration of medications that may have been compromised by exposure to extreme temperatures. USSC uses Temptime’s TransTracker® temperature indicators in all cold shipments. These indicators provide in-transit monitoring for both heat and freeze exposure, and can even help detect flash freezing events since exposure of the indicator to freezing temperatures will trigger the device. TransTracker indicators are easy for patients to read and understand, so they know “at-a-glance” whether or not their medications have been exposed to extreme temperatures. This is especially valuable when unexpected delays occur causing the package to go beyond its anticipated time in transit. Patients and doctors alike have expressed appreciation for this added measure to ensure the safety and integrity of their medications. 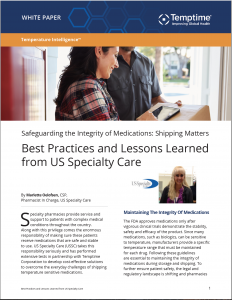 At US Specialty Care, we know that excellent shipping practices are a critical component to protecting the medication we dispense. Packing and shipping are specialized job functions in our facilities, requiring advanced and ongoing training as well as a pharmacy technician qualification. All our pharmacists and technicians complete training rotations in the shipping department to gain a full understanding of the complexities involved with shipping medications. Indicators are positioned as close to the medication as possible, avoiding direct exposure to ice packs as that could result in the freeze indicator triggering prematurely. The results? US Specialty Care has not only successfully reduced medication reshipments, but has also improved customer satisfaction. 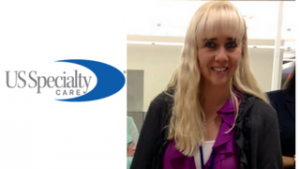 Internal customer satisfaction surveys demonstrated 97% of patients valued their packaging. As with all aspects of medical advances, education is key. Not only are the number of drugs that require special storage and transportation increasing, but the technology and materials to support transportation continue to advance as well. As healthcare providers, it is our responsibility to stay current with best practices and to continually explore alternative methods for ways to improve. This includes selecting and implementing best-in-class shipping methods for medications while providing safe, efficient and responsible patient care. Case Study | Temptime | 20Ways Fall Retail 2018 from RXinsider on Vimeo.